Cast on a multiple of 4 sts. Set-up Row: Knit 4, * yarn over, knit 4; repeat from * to end. Row 1: Purl 4, * knit 1, purl 4; repeat from * to end. Row 2: Knit 4, * purl 1, knit 4; repeat from * to end. Repeat rows 1-2 until you have reached your desired length, ending with Row 1. Loosely BO to first purl st, drop purl stitch from left needle and drop down. 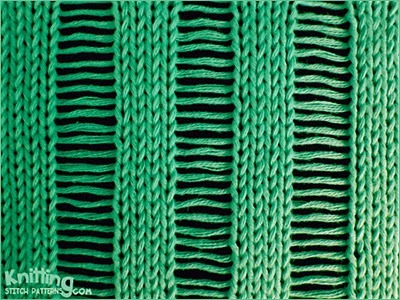 Pick up top running bar of unraveled stitch and twist into 2 new stitches on left needle and include them in BO. Repeat to end.